Seaside Park is a City of Saint John-owned and operated recreational park on the shores of the world-famous Bay of Fundy. The park is defined by stunning topography, wide ocean vistas and easy pedestrian access. Despite these highlights, the area has seen little ecosystem management or upkeep in recent decades, allowing its ecological and community value to often be overlooked. With renewed attention being paid to the park throughout 2017, including work on the new Seaside Park Elementary School, the time is right to renew our community investment to this tremendous asset. On the evening of May 16, 2017, ACAP Saint John hosted a community cleanup and dialogue event at Seaside Park, where attendees were encouraged to share their memories of Seaside Park and offer input on their vision for the Park going forward. This 'Sweep & Speak' event helped to inform any future actions, including the planting of additional trees and shrubs, and to pick up any debris within the park. Over 20 cleanup community volunteers attended the event, picking up 13 bags of garbage. The attendees were asked to share any ideas for raising awareness about the Seaside Park and protecting it into the future, as well as sharing stories or memories which will be recorded to share across the community. The feedback from this event was used to develop restoration plans for the park that respect our city's ecology while also reflecting our community’s shared aspirations for this beautiful community asset. On September 30, 2017, ACAP Saint John used Canada 150 funds secured through TreeCanada and CN to undertake some minor enhancements in the park. Community volunteers were invited to help plant over 550 native trees and shrubs through the upper (park-like area) and lower (coastal) portion of this park. Interpretive signage will be installed in the Spring of 2018 and will of be of benefit to the community, as well as allowing for collaborative programs to take place with students from the new Seaside Park Elementary School. 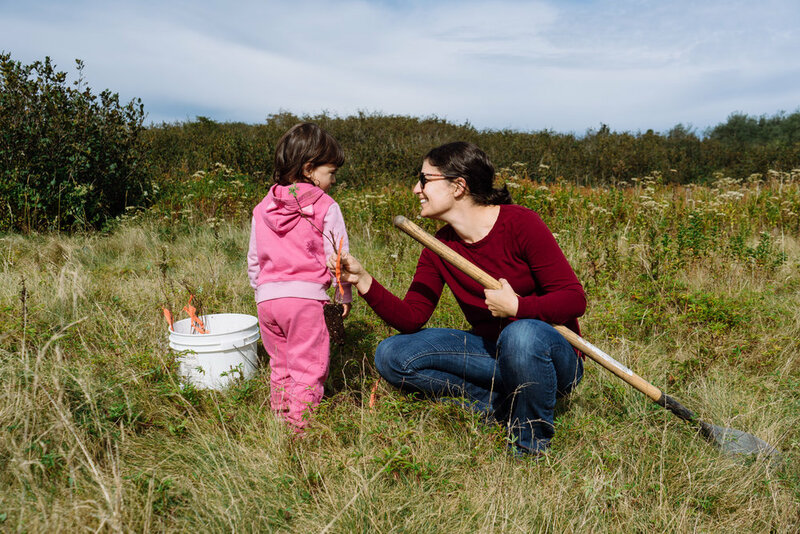 The overall goal of ACAP Saint John’s involvement is to develop an ecological management plan for the area to foster a renewed sense of ecological and cultural value, as well as to continue to participate in community-driven planting, cleanup, celebratory and educational events. ACAP collaborated with neighbourhood residents, local experts and Indigenous partners to steer this community-based revitalization initiative towards restoring the native ecological health of the area, while instilling a sense of community pride and continued stewardship for the site. The driving force behind the revival of this area has been the incredible outpouring of neighbourhood support and storytelling on the value of this location.